Today was going to be a long one because I wanted to complete 3 different drives. The first was this one that would take me south along the old main S90 road, via N’wanetsi and Satara then I wanted to drive west from the main north south road H1-4 right through to Orpen Gate. 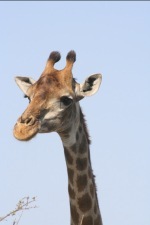 The third drive would be on the way back to Olifants via the much anticipated Timbavati River Loop S39. Don’t forget to click on the map to enlarge it. I was well on my way at 07.15. Temperature was 17 degrees C. I also made a mental note that I wanted to book accommodation further south if at all possible for the next night and would make the change from Olifants to whatever I could get at Satara. One of the first sightings was another of those “brown eagles” on a bare tree branch. The Eagle was facing away from me but was reasonably close. However I still could not positively identify it. 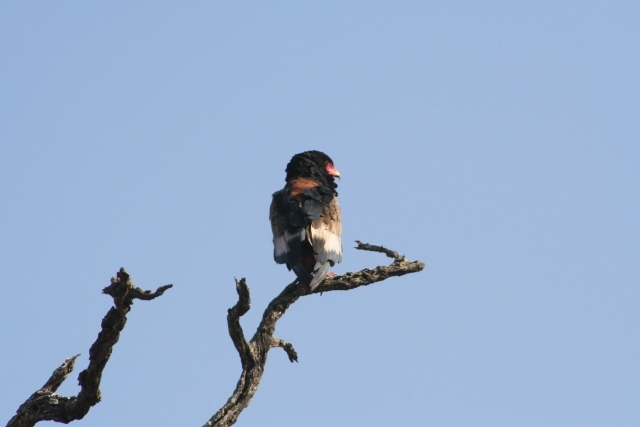 It wasn’t long after that I managed to get some good shots of a Bateleur Eagle close by. In this area was a profusion of community spiders nests. They were easy to spot because the trees were still bare. From a distance they look like small birds and then as you get closer that familiar “woolly” look becomes obvious. 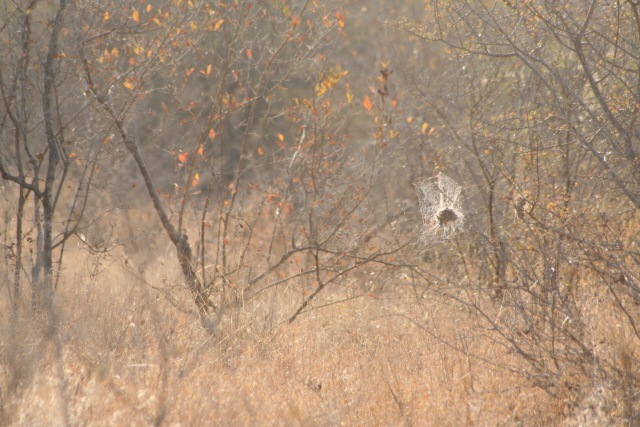 The picture shown here plainly shows the intricate web structure surrounding the nest. 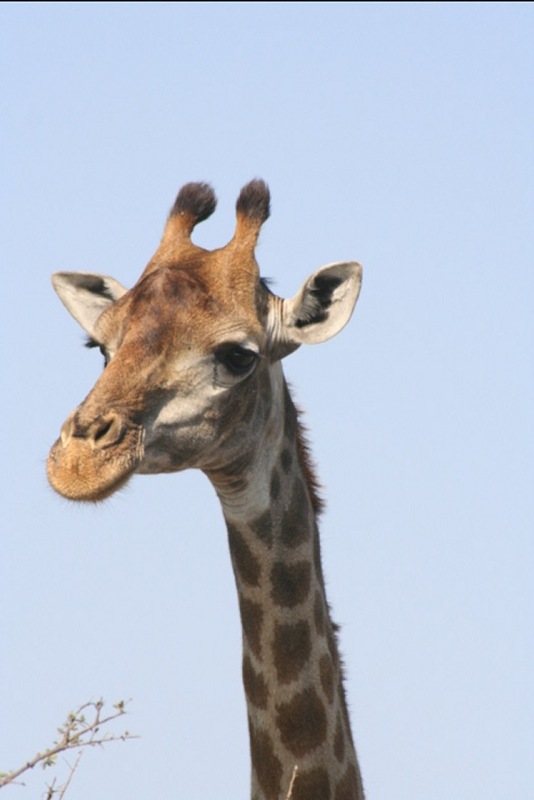 This area is known as Olifants Rugged Veld. Many thorn trees and bushes were evident, lots of slopes also, and the roads appeared rocky. Waypoint 459 is the turn off to the S90. Balule is 1 km from here and the low level crossing of the Olifants is just a few metres away. Looking downstream with the morning sun behind my back allowed me to get a magical shot of the river from this low vantage point. A Yellow-billed Stork was still in the position I’d seen it occupying on my brief visit the previous evening. At waypoint 460 I turned off the road to take a look at the Balule camping spot. There was a large group (is it flock?) 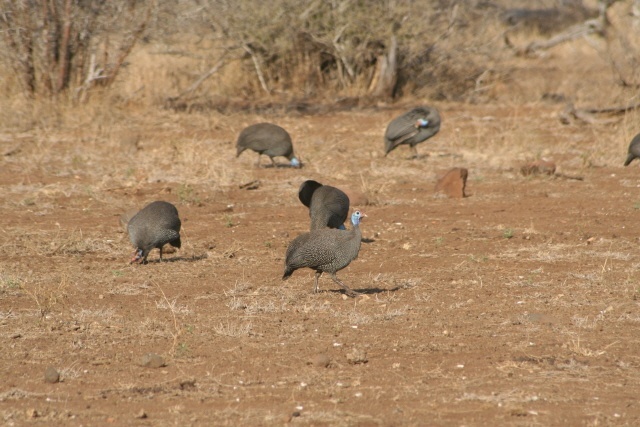 of Guinea Fowl feeding on a spot of open ground close to the Camp. These birds are really comical and they seem to like to follow each other through the grass in single file. 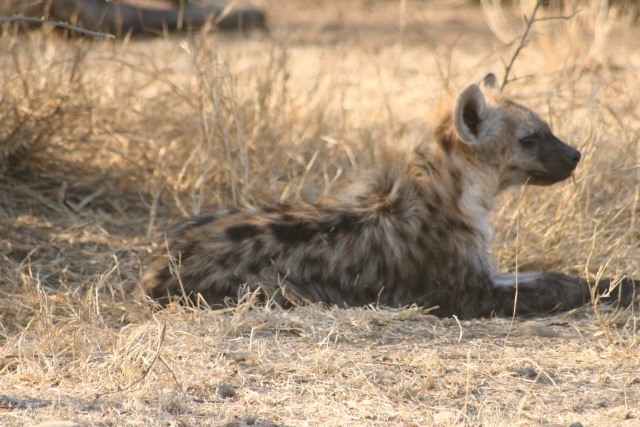 Waypoint 461 was the Hyaena’s den. 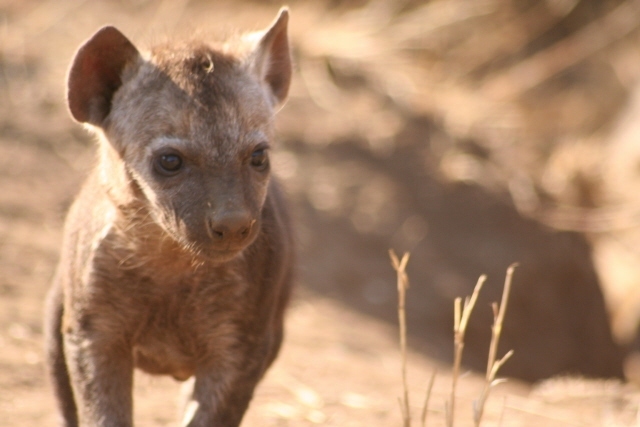 There were a few juveniles (3) and a small single puppy (probably 4 weeks old). 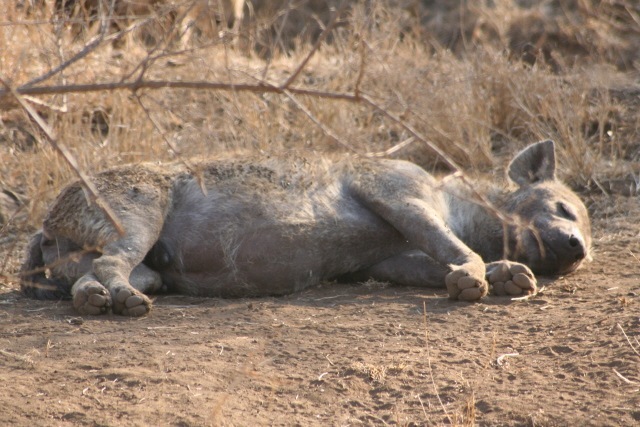 The Hyaena left in charge was lying down sleeping. It would wake up occasionally make sure all was OK and then lie down again. 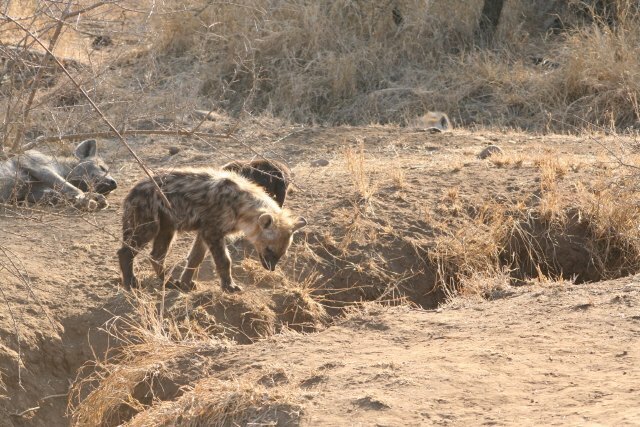 In typical puppy style the young Hyaena was full of mischief, biting the other older juveniles, clinging to their fur and tails as they walked and generally making nonsense. He particularly liked biting stones. The den was a ditch leading into a culvert that went underneath the road … and did the den stink? The smell of rotten meat was strong to say the least. Nevertheless it was a real privilege to be able to sit and watch this family known for their hunting and scavenging prowess. In years gone by the Kruger was also home to the Brown Hyaena but alas no more. There wasn’t room for the spotted and brown species in the Park and the more dominant species won the contest. The natural process whereby similar species compete for the identical territory is called Competitive Exclusion. In simple terms it means that the stronger species will always dominate to the point of extinction even for the weaker species that depends upon the same food and habitat. Just before waypoint 462 which is the S89 and S90 junction and from where I would continue along the S90 I was able to get some shots of a Bateleur Eagle perched very close to the road. There was also a very large Zebra herd accompanied by Impala and Wildebeest. I think this was the biggest herd of Zebra I’d ever seen in the Kruger. Less than 1 km from this spot was another large collection of Zebra, Wildebeest and Impala. The ground was quite open with lots of grass, sparse tree cover and remarkably quiet. It was 08.45, the sun was wonderfully warm already, the blue sky contrasting with the dark shapes of soaring raptors emphasized just one more time how fortunate I was to be able to do what I was doing. Waypoint 463 is a crossing of a small stream flowing gently, very muddy and showing lots of rushes growing in the creek bed. There was a lot of evidence of a herd of Buffalo having recently crossed this area. About 4 kms further along the road at waypoint 464 was the Bengu watering point, the windmill was turning in the breeze, and the ground was badly trodden. 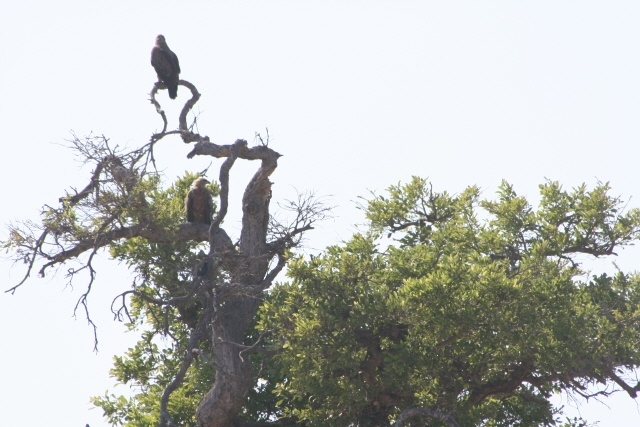 2 eagles were perched in the lone tree. The much trodden ground is an example of damage being done to the biodiversity within the Park as a direct result of human “interference”. Provision of artificial drinking spots encourages unnatural use and overcrowding of these areas and the eroded soil conditions result in destruction of plant life. It is why many artificial drinking spots are being closed. I continued past a small group of Giraffes and then came across my first Elephant of the day walking slowly along the verge with the road. Green shoots of new grass, too short for the Elephant, were sprouting on the verges. It wasn’t long after this that I stopped to have a chat with 3 rangers that were about to start their daily patrol in the veld. The rangers told me of the many Elephant and the general abundance of wildlife in the area and that they had to keep a close eye on poaching activities because the border with Mozambique was just a few kilometres away. 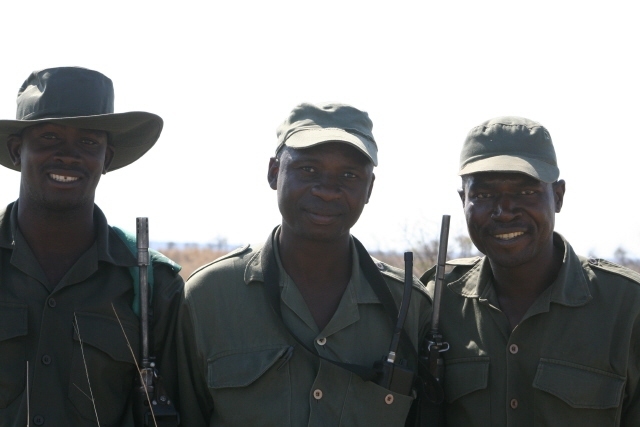 The rangers carrying high-powered rifles were named Fickson, Edward and Shadrack and I promised to post their photo on the web for them to see. They were based at N’wanetsi. 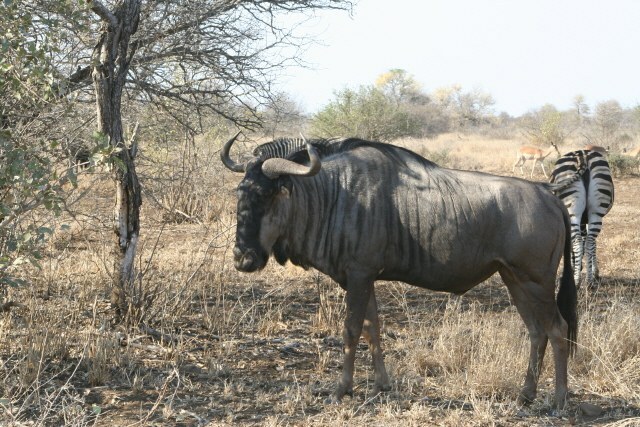 Close to waypoint 465 which was the S90 and S41 junction there was a herd of 10 Waterbuck. I turned onto the S41 heading towards N’wanetsi, continuing south. The S90 would come out at the H1-4 just north of Satara. 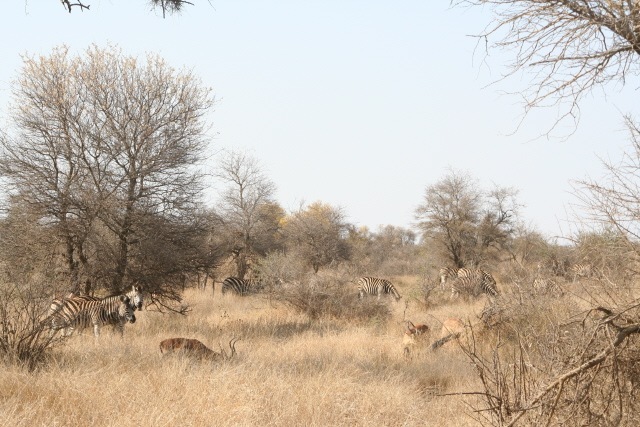 I also saw my sixth or seventh herd of Zebra since I left Olifants around the same point. 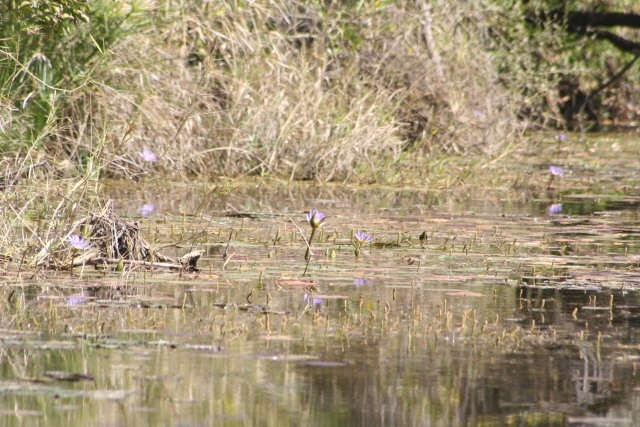 At the Gudzani crossing before the dam there was at least one Hippo in the pool and I saw my first Kudu of the day. Waypoint 466 is the crossing of the Gudzani as it comes out of the Dam and the river was flowing quite well. I paid a short visit, as I’ve done many times before, to the Gudzani dam which is indeed a very impressive and large area of water. The Dam is fed by 2 rivers, the Gudzani River and the Mavumbye River, which rises just west of the main H1-4 road. The Gudzani on the other hand drains points almost directly north of the Dam itself. 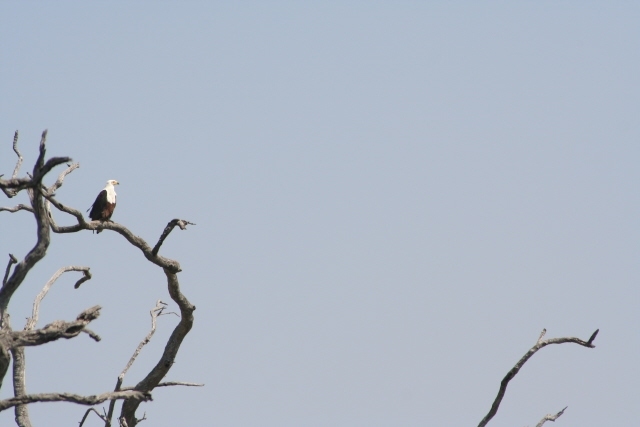 A Fish Eagle was sitting patiently on a dead branch watching the water. There was also a creeper with bright red bracts growing right on the edge of the stream. It reminded me a bit of a bougainvillea. I’d see the same tree at occasions later in the day but always very close to water. I think it is Combretum paniculatum (Flame Creeper or Vlanklimop). The leaves were very bright green. 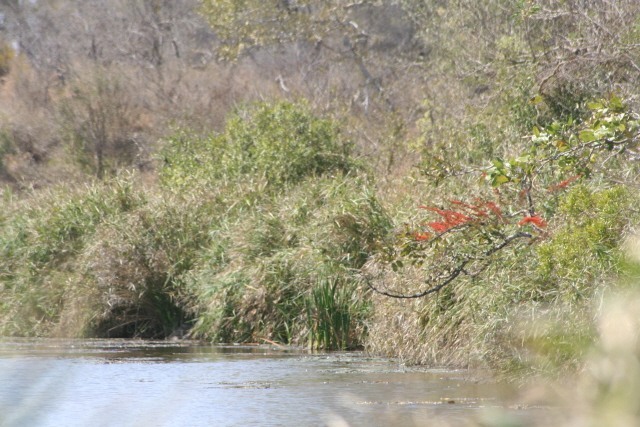 Waypoint 467 was a crossing of the N’Wanetsi that flows almost directly west to east across the Park to join the Gudzani closer to the N’wanetsi Picnic Spot. 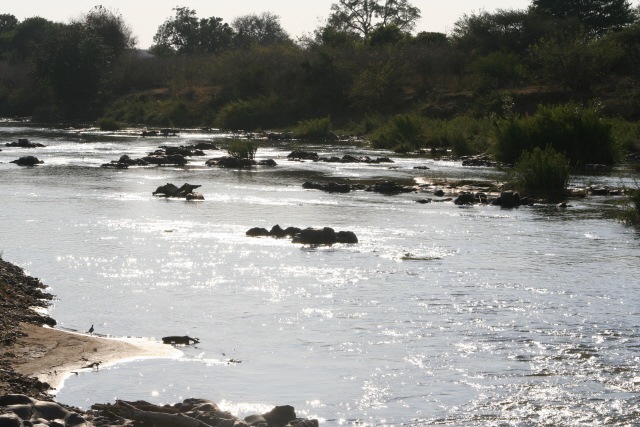 There were beautiful river pools to be admired at this crossing and there were large herds of Impala close by. 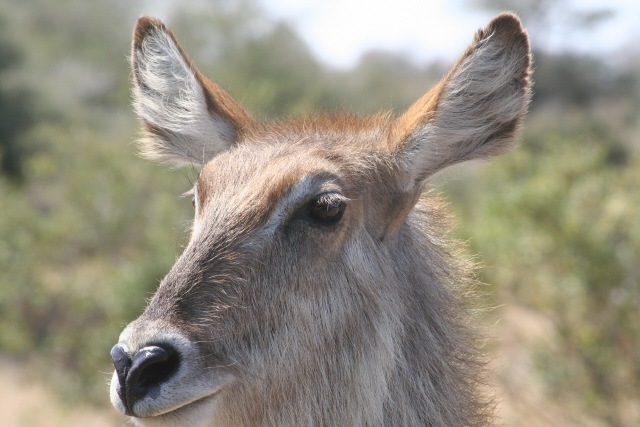 There were waterbuck and Kudu also in the immediate vicinity. 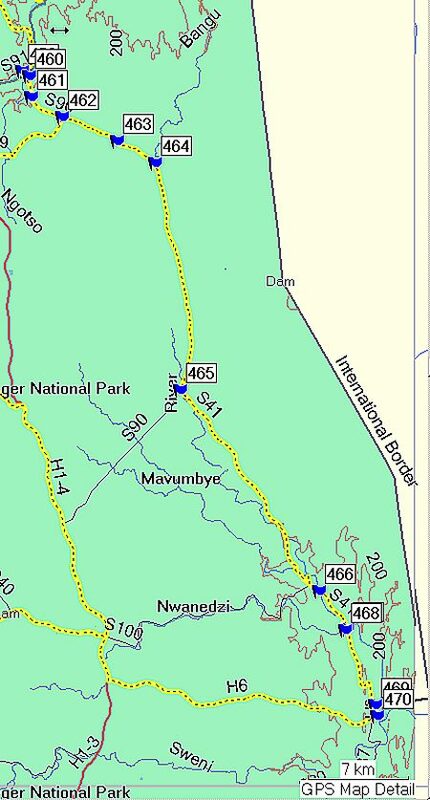 Waypoint 468 is a viewing point over the N’Wanetsi River just downstream of where the recently joined Mavumbye and Gudzani had merged into a single stream. This point was really magnificent, full of reeds, rushes, beautiful large trees and still pools. Waypoint 469 adjacent to a pool with a show of Blue Water Lilies that were only just opening up for the day was the turn off to the Private concession lodge which is about 1 km from the N’Wanetsi Picnic Spot at waypoint 470. After a short relief at the Picnic Spot I continued down the H6 road to get onto the H1-3 for about 3kms before turning west to complete the Orpen H7 road. Corumana Dam Threatens Last Kruger Gorge on Perennial River.